Posted On October 22, 2014 by Team iCynosure. Every morning I ask myself if I’m happy and I know that I couldn’t have been happier. You must wonder why? Simply because I’m a mom, simply because I have a little bundle of happiness sleeping right next to me practically snuggling into me making me the happiest person in this world. She bring in so much light into my life that it becomes most important that I ensure that I do everything that I can for my princess. Just like every mother who dreams to give the world to her children, I wish the same for my little one, especially health and immunity that would ensure her wellbeing. However, it wasn’t the same always. Early on my daughter was diagnosed with Baby Colic and identified as Lactose Intolerant. Never ever heard about children not being able to drink external milk and consume milk products, my life literally turned upside down. However, this didn’t seem to affect her at all, touchwood! She remained her fun-self, super active and highly charged with every passing day. Health is what brings in a wealth of life, #ImmuneIndia. With a little hiccup of a medical difference, I become more attentive to my daughter’s health needs. As a mother I did put in my best foot forward…. We, Princess and momma created a wonderful program to bring health into our lives. Personal Needs of every individual are different and so we identified our desires and needs and put them in line with what our bodies warranted. Lifestyle fuels health and thus we incorporated a sustainable sleep, exercise and nutrition regime. Environment that we live in also decides the quality of your health. However we try not to shield from external factors, but go and expose ourselves to it; to up our immunity. Nutrition is food for health. Thus we try to manage a healthy balanced diet filled with various colors and fibers. Ofcourse we do indulge in some junk food at times but we try and balance it out with good stuff that flushes out the toxic. Last but not the least we add some old-age remedies of natural ingredients into our daily lives to help boost our health and immune system. Earlier my mother-in-law used to add Herbs, Chamomile, Amla, Honey, Aloe Vera and many such things and make a paste for us to gulp every day. 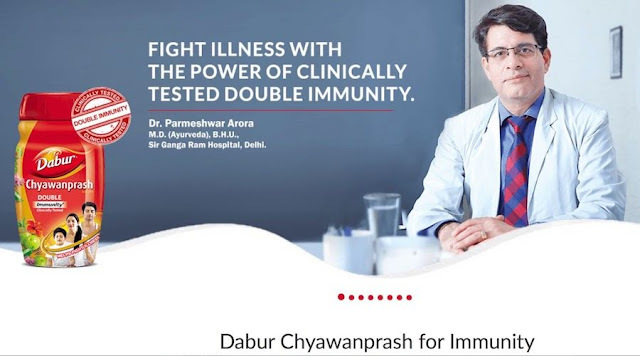 However now we strengthen our immunity with a spoonful of yummylicious Dabur Chyawanprash daily. So once I am rest assured and I don’t have to worry about the health of my child, I put all my energies towards enjoying each other cause real happiness is not an immediate event, it is not a single act. Real happiness is the tiny instances that fill your heart with intense, which can be relived without a thought. It’s fun to run behind you my Minnie mouse! My heart bursts open like a beautiful flower! Make my otherwise vile life worthwhile. Which Dabur Chyawanprash takes care of without a yearn! So what do you do to ensure the health of your little one? Isn't a healthy baby a path to a happy home!